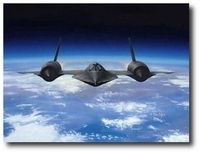 Developed for the USAF as reconnaissance aircraft more than 30 years ago, the SR-71 Blackbird was the world's fastest and highest-flying production aircraft. The aircraft could fly more than 2200 mph (Mach 3+ or more than three times the speed of sound) and at altitudes of over 85,000 feet. 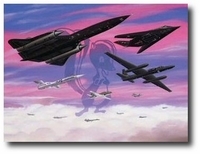 Co-signed by over 60 SR-71 pilots! "On the Edge of Night"